The Lightning Press is a service-disabled, veteran-owned small business DOD-approved vendor and federally registered — to include the System for Award Management (SAM), Wide Area Workflow (WAWF), FedBizOpps (FBO), and FEDPAY. 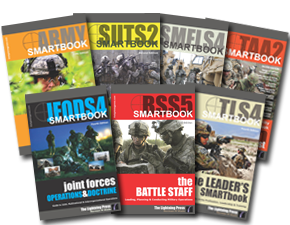 As the author,copyright holder and publisher, we are a sole-source provider for SMARTbooks. Our highest demand remains from the military and organizations that support and work with the Services, State and Federal Agencies, and the Department of the Defense. We have the capability to accept and process both Government Purchase Cards (GCPC/GPC) from card holders and Purchase Orders (PO) from Contracting Organizations. All orders to Federal Government organizations and military units are TAX FREE. View our Government Sales page. Need a Written Quote or Have a Question?